'Saree is the only attire which is an amalgamation of sophistication, fashion and elegance' - Hema Vinothini, Founder of CLIO | Unkrate | Creating Experiences. 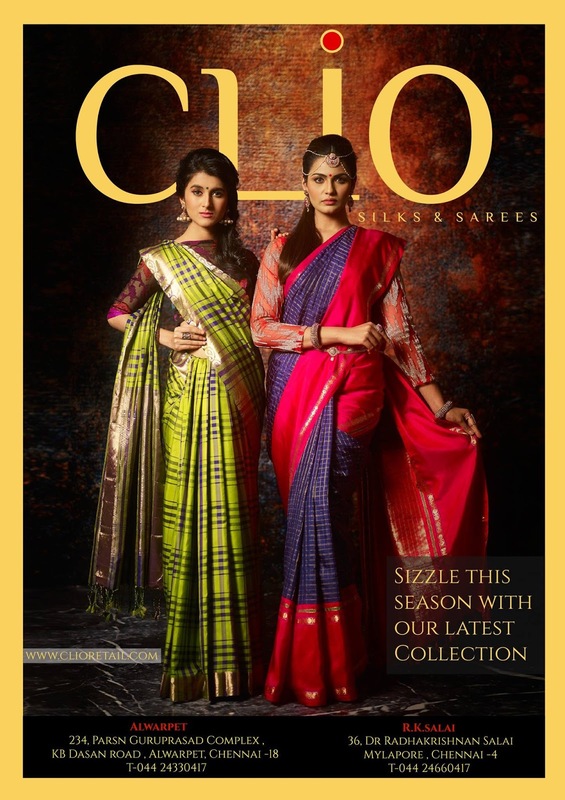 Clio, a contemporary clothing boutique in Chennai stocks a stunning collection of designer saris, silks, salwars and unstitched suits for women. They offer exclusive tailoring facility to all their customers, which include blouse designs, customized Lehengas, Wedding saris, etc. Founded in 2012 Clio caters to all kinds of consumers with a saree ranging from a price of Rs. 800 to 8 Lacs. So far they have sold over 10,000 sarees all over the world including Fiji, Japan, Philippines and mostly USA , UK , Australia. The reason is the kind of range of designs and ethnicity they carry. From the elusive yet explicit Kanchivarams, the Tussars of Jamshedpur, the Ahimsa silk of Assam to the timeless beauty of a Banarasi Saree the craftsmen at Clio takes pride in customizing even designer Georgettes and Chiffons. Hema Vinothini in an interview with Suman Prasad spoke in length about the various aspects of her brand, current consumer trends and other interesting details. At Clio every woven thread linking the exquisite garb that adorns a woman’s body is inspired. Every Saree out of its collections is a reality of the belief that each one has a story to tell. The designers’ weaving techniques, fabrics, attention to or designs and customer’s choices alike done with intricate sophistication. The philosophy of Clio is that they are not just a brand, they are matchmakers. I realized Clio as a vision of a daughter who witnessed day in and day out, her mother wrapping herself with such exquisite colors and fabrics with impeccable taste. The journey from a little girl to the founder and designer has been such that Clio has been one of the few to create a raging buzz in the online sphere with its marketing interface. Clio is every woman go to brand . The customer service we offer, the wide range of exclusive sarees we have, the one to one connection we make with our customer is what made us the "store next door". We have ranges which is affordable and our target audience are 20 years up to 55 years . A brand should know four things - its target audience, the product line up which they are going to offer, marketing strategy and branding of the company as how it is going to project itself in the next 10-20 years . I am a mixed-buyer and never compromise on quality. I love heritage, quirky stuff and also frugal when it comes to buying .The sarees which we have are a mix of all these. We have the heritage banaras, kanchivaram sarees, quirky chiffons, patch works among other affordable collections. The response has been tremendous. From a single 120 sq. ft. store we have opened another branch of 800 sq. ft. and we are in the process of expanding further. Our key market is Chennai and focus is on working women, entrepreneurs, fashion conscious women who loves to dress up. We have a wide spread of customers pan India and overseas customers is mostly from the US, Canada, Malaysia & Singapore. Location of the physical store and our online presence in all the social mediums have made us a reckoning brand. It is safe to say that we were one of the clothing brands in Chennai who have utilized social platform for promoting our brand to a good extent. We offer sarees starting Rs. 650 up to Rs. 30000. 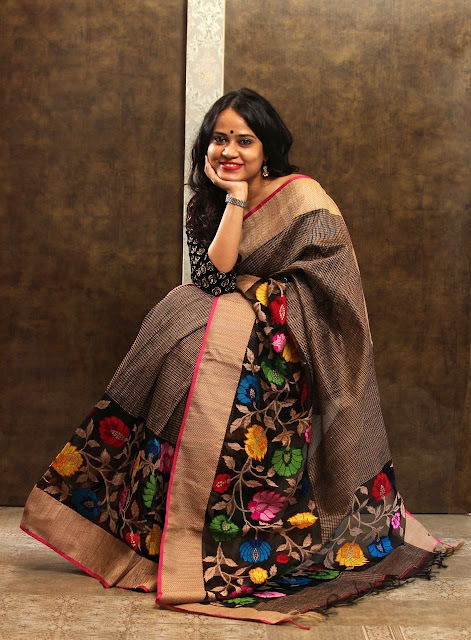 The sarees include handloom cotton, printed cottons, Tussars, silk-cotton, jute silk, blended silk, Kanchivaram silk, Soft silk, Chiffons, Banaras kora, Banaras silk, Kota sarees, designer sarees and we also customize lehengas, Anarkalis and blouses. Not only saree is a chic form of dressing but is also regal in terms of the weaving technique, the source of the fabric whether it is Banaras sarees, Kanchipuram pattu sarees, paithani weaving or any prints, embroidery and embellishments. The current favorite is trendy blouses in terms of stitching, paterns and embroidery work which involves zardosi, cutwork. However, the beauty of the saree lies in its tradition and simple cholis and petticoats can never be substituted for an elegant and timeless look. There is always a constant scope for evolution for this timeless beauty. Saree is the only attire which is an amalgamation of sophistication, fashion and elegance. No matter how fashionable or fusion you create with clothes, the essential 6 yards saree should stay as it is. Indian designers have added a healthy dose of irreverence and lightness by working the many ways to wear a saree. Whether it is worn as a pre-stitched, with dhoti pants or a reversible saree. Modern Indian woman embrace the legacy of wearing sarees at their wedding or any important functions, festivals, events etc. Brands like Hermès, Jean Paul Gaultier and Marchesa too have shown it in their own handwriting over the years. Nonita adds, “The fact that international brands have referenced it — Hermès in a more traditional way, Marchesa with red carpet glamour or my favourite Jean Paul Gaultier “sarisque dresses” — is an important step in the acknowledgement of the sari’s timelessness. In India, sarees have become the most vital clothing in every woman's wardrobe. The growing love for handloom with the help of social media, plenty of women have declared their love for the saree as their daily wear. The "100 days saree pact", "wearing only Kaithari (Handloom)" have gained momentum among women and has further motivated others to carry on with this trend. At present, we are looking to extend our geographical presence by launching a range of exotic boutiques across leading malls and prime locations across the country. We believe this would help to achieve more brand visibility and a popular name to reckon with. Redefining the existing trends, Clio aims to create a benchmark in ethnic wear, thereby expanding our business in an enormous way.